This calendar displays events for several New York City sports teams. These events are maintained by the individual sports teams. Some feeds, including the baseball feed, automatically update the game scores as well as add new events when they become available (playoff games, for example). 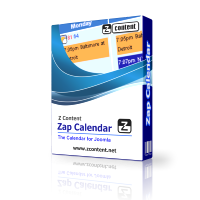 This is accomplished by Zap Calendar's iCal Sync plugin, available in the Pro version of Zap Calendar. This calendar page utilizes the following Zap Calendar add-ons: title, event filter, iCal sync, month header, moon phase, Social Like, Google Maps, Zap Weather (for New York City weather info), comment, upcoming events, recent comments and QR code (square barcode).